Grandson Asher and granddaughters Kate and Emma live in Georgia, a long ways away from grandmothermath and grandadscience. We stay in touch with the kids using our iPad, FaceTime, cell phone calls, this blog, and the packages grandmothermath puts together and mails to the kids in Georgia and the two grandsons (soon to be three grandsons) living in Virginia. Asher is in kindergarten this year and Kate is in preschool. Emma isn’t yet a year old but is working hard to catch up with her older brother and sister. The AIMS Education Foundation (www.aimsedu.org) publishes and sells an inexpensive series of hands-on science books aimed at the primary grade levels. One of the books we recently ordered and had mailed to Asher, Kate, and Emma, is called Primarily Magnets and is designed for grades K-2. In the following pictures you see Asher with pages from the magnet book along with another of his favorite books, The Berenstain Bears' Really Big Pet Show, by Jan and Mike Berenstain (www.goodreads.com). 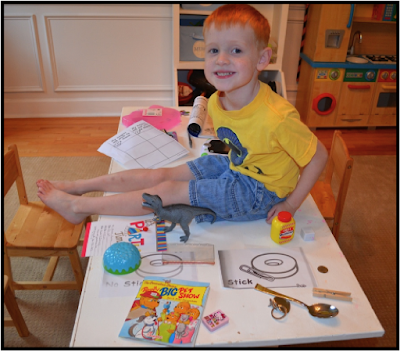 On his play table, Asher laid out the materials needed for one of the magnet activities from the book and a few of his animals. 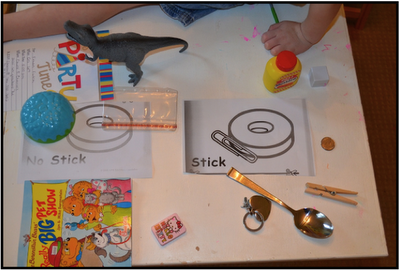 Each magnet activity includes clear instructions for mom and dad. Asher begins testing a variety of materials and identifying those that stick to the magnet and those that aren't attracted to the magnet. 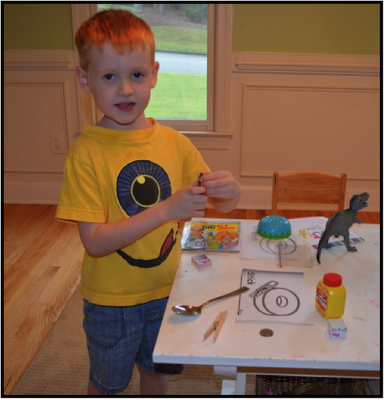 In the following pictures, Asher tests an old fashioned clothes pin made of two materials. He finds the magnet sticks to the metal spring but not to he wooden pins. On which page should the clothes pin be placed? Hmmmm. So far, metal objects stick to the magnet. 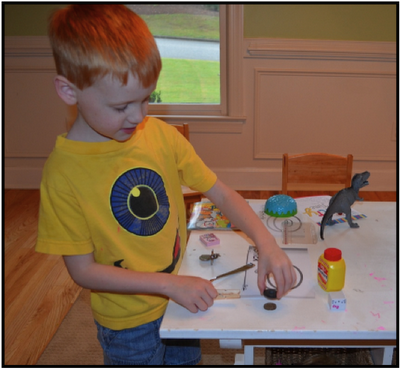 Now, Asher tries to pick up a metal coin with the magnet. Will the magnet stick to the metal coin? Go to your nearest Radio Shack and ask for a 5-pack of round, ceramic magnets (Catalog #: 64-1888). It will only cost you three bucks. 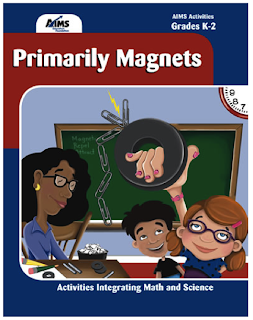 Then you can test a quarter yourself and pass the magnets on to the kids and grand kids. A big thank you to Asher’s mom and dad for taking these pictures for us. Being such a long ways West of Georgia, we always enjoy pictures of the kids and we look forward to the time we will be there with everyone this coming Christmas.